« Infento Constructible Rides. Building from The Ground Up With Your Child And Giving Him/Her Technical Skills. Published by Cyril Huze September 17th, 2015	in Customs, Editorial and Exhaust. The new Indian Scout offers a a nimble, sporty platform with modern performance technology. 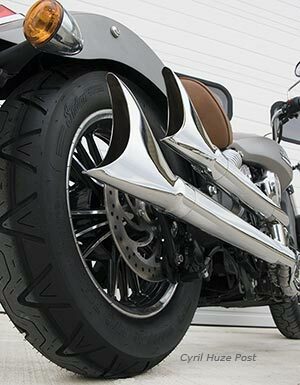 But all those looking to add a touch of retro to the midsize cruiser will love these new staggered Longtail slip-on mufflers by Samson Exhaust. These high style Longtails are endowed with removable high performance baffles and look as good as they function. The baffles are removable to allow the rider to go loud, or ride stealthy. Samson states that you can expect as much as a 20% increase in horsepowerand a marked improvement in fuel economy. MSRP from$449.95 to $549.95. Other exhaust systems for the modern Indian motorcycle are available. See your local Samson Exhaust dealer or contact Samson direct by calling 1-888-5 SAMSON. Fishtail pipes on an Indian always look good. “As much as a 20% increase in HP” ???? By changing Mufflers? That could be true…I.E., a 2% increase would fall within the UP TO claim. I’m thinking the same thing Richards. 20% without documentation is quite a claim. I could see it with intake and fuel controller. But pipes alone? Even on a motor that revs to 8000 rpm, you’d need about 12 more ft-lbs of torque at 8000 rpm to get to 20% more hp. I’m skeptical. Well, added power or not, ya just gotta love that classic look…. Always been a fan of the fish tail pipes. Too bad Samson didn’t send a better side view picture. The slip on mufflers look good, now they just need to address the ugly front pipes and the way they are routed. Maybe they mean 20% increase over performance added by stock pipes (vs without pipes)?